MDS hair care offers accessible luxury and high performance products with noticeable effects, you can see, touch and feel. 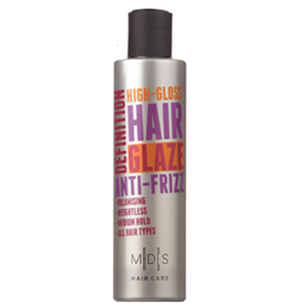 MDS hair care includes hair styling products as well, making it perfect for complete and high quality hair care: cleansing, caring and styling. These products have the same professional and salon care status and are hairdresser-approved. A wide range of hold levels and textures for all desired and imaginable hair styles. The inviting design breathes diversity and inspires the creativity of the user. The invigorating high quality fragrances lift the experience, starting with fresh green notes, a floral heart and an elegant musky base note. Beautiful, clean and styled hair is the highlight of our face and appearance. From early morning to late night we care to appear at our best. 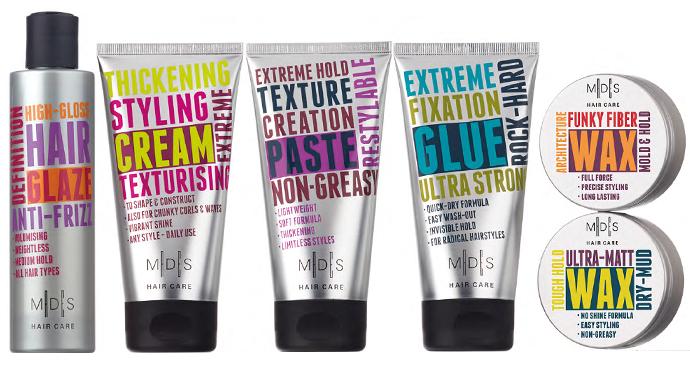 MDS Hair styling products will help you get the look you have been dreaming of. Go ahead and glossy up! Alcohol-free formula with a complex of fruit extracts, Glycerine and vitamin E for high-gloss shine and softness without weighing down the hair. Polymer anti static technology with a memory effect defines all hair types, creating softness and shine and eliminating static electricity. Moisturisers maintain the balanced hydration of the stem of the hair eliminating frizz. Conditioning agents soften and add shine, while the film forming improves hair combability and eliminates the effect of static electricity. Film-forming polymer allows and boosts the formation and duration of curls, waves or any styling with a flexible hold. 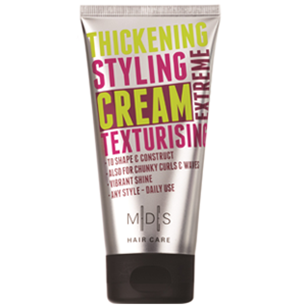 This texturising styling cream helps to shape and construct any hairstyle. For the creation of thick, chunky pieces with definition and separation. Resulting in healthy looking, strong hair with remarkable body, impressive fullness and vibrant shine. The lightweight formula with natural waxes is suitable for daily use on all hair types and textures. 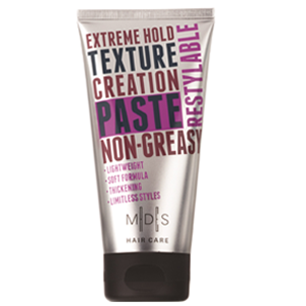 This lightweight hair paste is versatile, soft and suitable for creating limitless styles. 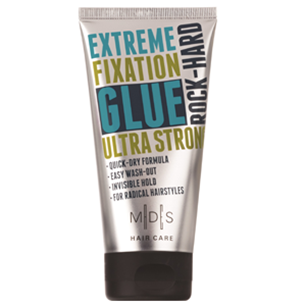 Gives extreme, but pliable hold while providing texture and thickness. Resulting in a non-greasy creation which can be restyled during the day. Suitable for everyday use. This hair glue combines 5 film-forming polymers. This ultra strong gel creates easy radical and dramatical hairstyles. The quick-dry formula gives a rock-hard and invisible hold. Although it creates extreme fixation it is easily washed out. Suitable for everyday use.